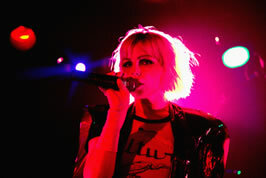 Rock with the Ultimate Blondie Tribute! So Blondie were formed in 1999 after Helen won critical acclaim for her portrayal of Debbie Harry in a successful national UK tour. Helen's electrifying performance of Debbie Harry is further enhanced by the live band of high energy musicians who perfectly recreate the seminal sound of BLONDIE. This Punk, Funk, Rap, Rock, fusion will take you on a glorious journey of musical nostalgia. Relive the past with all the very best that is BLONDIE; Anthems like UNION CITY BLUE, ONE WAY OR ANOTHER and ATOMIC, through the disco classics RAPTURE and HEART OF GLASS, to the floor filling TIDE IS HIGH and MARIA! SO BLONDIE takes you through hit after hit! They have played at many prestigious venues, festivals and events across the globe and can regularly be seen at London-tribute favourite THE VENUE. Support credits include BAD MANNERS, BONEY M, MARC ALMOND and SLADE. Helen has even appeared onstage with Debbie Harry at the GUILFEST. If you want the best, then look no further. 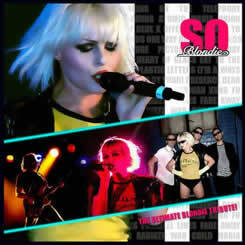 SO BLONDIE has got to be the ultimate tribute to BLONDIE that the UK has to offer!